Tricia Goyer is the author of more than 35 novels of both fiction and non-fiction genres. She has also published more than 500 articles in national publications. 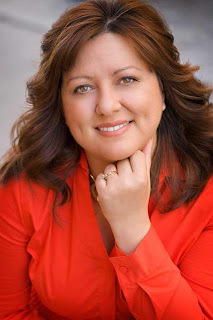 You can learn more about Tricia Goyer at her website. Thankfully being a launch team member for Tricia, I get to bring you cool things like this post. It's all the questions that us launch team members asked Tricia, and she happily obliged by answering and allowed us to post for you all. So here is what we just had to know. Jalynn Patterson: How do you pick characters for your books? I had to think about this question for a while because the characters seem to pick me! When I get the idea, the people sort of show up. When I first thought of The Promise Box I immediately saw Lydia with her red hair blowing in the breeze as she drove up to the West Kootenai. I felt her uncertainty and vulnerability, and that came out on the page. Jalynn Patterson: How do you come up with a storyline? Do you have a process you go through? The title of the book usually comes first and the general idea of what will happen. The characters soon follow, and they're usually dragging BAGGAGE. I use a lot of baggage in my books: past pain, hurt relationships, burdens, and regrets. Then I think about the theme. For The Promise Box, it was TRUTH. Any time my characters grew in truth, walked toward truth, and turned to Jesus—our TRUTH—then things went well. Any time they focused on lies or mistruth, then things got hard for them. Just coming to this realization helps me shape the main plot points of my novel. Since I have two characters they will each have their own struggles, but they will both deal with the same theme. Lydia needed to discover the truth of her birth. Gideon needed to discover the truth of the day he got lost. Of course as they both try to come to terms with the truth, a dance happens where they are pulled together and pushed apart. Once I get the main plot points written down, then I start writing. I usually write the first chapter, but then after that I'll jump around. I'll move from the beginning, to the end, and then I'll write a little here and a little there throughout the book. I usually hit the main emotional scenes and focus on those first. I have those scattered throughout the book. After I have about 1/2 of the book in pieces, I then start from the beginning of the book, starting over at chapter one and moving through the manuscript. By this point the whole story is already in my mind—like a movie—and it's just getting it on paper! Laurel Thomas: How do you pick Bible verses for your books? Each of my books has a theme. In fact this is the first thing I figure out with all of my books. For example, in The Promise Box my focus was “truth.” Throughout the book the Scriptures I picked spoke truth into a character's situation. Many of the Scripture verses in the books were ones that spoke to my life. They are seeds of truth I've planted within my own life that find themselves on the page. Laurel Thomas: Do you actually try the dishes that characters eat? I have tried some of the Amish recipes. I've made whoopie pies and some of the other treats. But some things I've tasted from Amish restaurants and I didn't make . . . but I haven't had anything that I didn’t like! The Amish have very good taste! Sarah Reed Levels: How do the Amish deal with adoption? The Amish deal with adoption just like anyone else. They have to follow the same laws and go through the same processes. Adoption isn't common, but it does happen in the Amish community. That's all we have for now. If more come I will be sure to share with you all. For now, why don't you get your copy of The Memory Jar and The Promise Box, so you can read along with me. DISCLOSURE: Freda's Voice is a Tricia Goyer Launch Team Member. No compensation was received for posting.